Yes, this game actually happened. Fast, slow, what do you know? I'm pretty sure this event isn't getting rated. A couple of readers have shared with me a BBC link about a new play based on the Kasparov v Deep Blue match from 1997. It is called The Machine and will premiere at the Manchester International Festival in July. It focuses on Gary Kasparov and Feng-Hsiung Hsu (one of Deep Blue's designers), with chess being "the least important part of the play". However Kasparov must be in season as there is a second play featuring him, called "The Gambit". This play focuses on his rivalry with Karpov and is currently running at the Bath Fringe Festival. After that it goes on tour to other venues around the UK. I'm trying to follow the games from the Thessaloniki GP, while at the same time juggling some other chess activities. However I keep being drawn back to the Ivanchuk v Svidler game, which is still in progress as I type this. What is really fascinating about this game is that it once again demonstrates that Ivanchuk just operates on a different level to the rest of us. Yesterday he played an absolute shocker against Ponomariov (losing in 19 moves), so you would think he might just take a steady course against Svidler today. And of course you would think wrong. Instead he has gone the bash, sacrificing an exchange while looking for a mating attack. So far Svidler has beaten off the worst of it, but it is still a position where one slip could end in disaster (for either side of it). As it looks like it won't be finished before I post, I'll put up the moves as they currently stand, and fill in the rest in the morning. Trawling through my database of recent games (courtesy of Chess Today), I was surprised to find very few interesting miniatures played in the month of April. There was one game from Israel that went 1.g4 e6 2.f3 Qh4# but clearly there is a story behind it that I am not aware of (The loser was rated 2445 btw). So here is a game that was played on April Fools Day. For most of the game it just burbles along without anything too dramatic happening, but on move 19 (1 move before the cut off for the miniature category) White moves his rook to the wrong square, missing a back rank mate. Having demonstrated the difficulty in hacking at CC, I can now provide further evidence regarding the same idea in OTB chess. This game was played this evening at the Belconnen Chess Club, against Tomson Qin. I decided to avoid Open Sicilian theory by choosing the Closed Sicilian, and was helped by my opponents setup. While my position looks scary, and I thought I was better for most of the game, my opponent missed some key defensive ideas. Unilke CC, where he would have days to find the best defence, in this game he was under 10 minutes around the time I sacrificed on f6. As a result he lashed out with Nxe5, which turned out to be the losing move. Either 26... c3 or even 26. ... Ne7 would have forced me to think a little bit harder, but to be honest, I'm sure the combination of threats against the king, and my opponents shortness of time would work in my favour anyway. As the title of the posts says, playing a successful hack in Correspondence Chess seems to be a lot harder than in OTB chess. I've now had a couple of games where I've built up a position that suits my sac and hack style, but looking deeper into the position, I've had to cry off. Unlike my OTB analysis, the assessment "I have no idea what is going on" doesn't fly in CC. The following just completed game is an example. I spent a lot of time trying to make ideas around Nxd5 work, as well as trying to justify various rook sacrifices down the g and f files. I did think that my idea of h6 was pretty inspired, until I saw that I had missed my opponents reply of g6. In the end I repeated the position to split the point, but all through the latter half of the game I was wondering if I was missing the knock out blow. I was asked today what is the shortest possible game that ends in Stalemate. The answer has been known for quite a while, with Sam Lloyd finding that 10 moves is all that is needed (Game given below). This solution is not unique btw. The shortest stalemate without captures is 12 moves (also found by Lloyd), while the fastest 'double stalemate' (neither side can move) is 18 moves (found by Enzo Minerva and published in 2007). While flicking across the various sports channels I happened upon the half time summary of the Sydney v Collingwood game played this event (Australian Rules Football for those unfamiliar with the team names). One of the analysts was using a chess board to show the movements of the players when his fellow commentator piped in "The way you move those chess pieces reminds me of the great Boris Spassky, who was World Champion in 1985 (sic)". I give 8/10 for making the effort, but 1/10 for historical accuracy. Destined to be featured in a future edition of "The Complete Chess Addict" comes a game from the recently completed 2013 European Individual Championship. It is not every day you see 3 queens of the same colour on the back rank (outside school chess events anyway), but at move 50 you do. Despite the smattering of material for White, and a passer on a6, the co-ordinated forces of her majesty's is enough to win the day. (Thanks to Chesstoday for bringing this game to my attention). Normally the FIDE Laws of Chess get updated every 4 years. The last update came into force on the 1st July 2009, which means that on the 1st July 2013 an updated set of Laws was to be published. One of the reasons for this is that changes to the Laws of Chess must be approved by the FIDE General Assembly, which normally meets every 2 years. However the process went a little of the rails last year, meaning that the new Laws will not be published on the 1st July. One of the reasons was that despite the efforts of all involved (including myself), there were a couple of issues unresolved when the GA was in session. At first it was thought that the best way to deal with this was to leave the final approval of the proposed changes to the FIDE Presidential Board. However the PB then came back with proposed changes beyond what was discussed before the last GA, leading to a kind of confused impasse. Members of the PB wanted to see their changes go forward, while members of the FIDE Rules and Tournament Regulations Commission weren't happy with changes that had not been discussed by the committee. As a consequence the FIDE website has just announced that that proposed changes (which haven't been officially agreed upon) will be discussed at the FIDE Congress in Tallinn later this year, with the possibility of publishing them in 2014. The 2013 Asian Continental Chess Championship is currently being held in Manila, The Philippines. This years event has quite a large prize pool, courtesy of celebrity sponsor, Manny Pacquiao. Pacquiao is the first boxer to win titles in 8 separate divisions, as well as being a member of The Philippines House of Representatives. Fourteen countries are represented in the Open Championship, in a field of 77 players. The largest entry comes from the host country, and while Australia/NZ/PNG are not represented, tiny Guam is being represented for the first time by Efren Manuel. If you want to follow the action then the best link is probably here, as I have not been able to find a tournament website. There is also links to results, pictures and videos from this page. Blind Chess is not quite the same as Blindfold Chess. In the latter a sighted player plays without sight of the board, while in Blind Chess, the players are visually impaired. For those that have played at the SIO or various NSW Country events, Alex Momot is an example of a blind chess player, while Ted Bullockus, who played in the Doeberl Cup in the 1990's was legally blind, although he did have partial sight. And in last years Chess Olympiad, the team representing the International Blind Chess Association finished 44th winning 5 matches (including one against New Zealand), drawing 3 and losing 3. Blind Chess is particularly popular in India, and there is now a documentary on the subject. "Algorithms: Four moves in, we are all blind" is being shown at the upcoming Sydney International Chess Film Festival. It follows 4 blind chess players from India for 3 years, leading up to their participation in the World Junior Blind Chess Championship. Well Norway 2013 did not quite go according to script, with Sergey Karjakin finishing half a point ahead of tournament favourite Magnus Carlsen. Karjakin had a half point lead going into the final round, and kept that lead after his game against Topalov was drawn, while the Aronian - Carlsen game also ended in a draw. Joining Carlsen in second place was Hikaru Nakamura, who defeated Jon Ludwig Hammer in a nice final round game. One thing that is now starting to look like a tradition was the moments of madness that occured in the last 2 rounds. Round 8 saw both Karjakin and Carlsen lose, while the last round saw World Champion Viswanathan Anand lose to Wang Hao. Despite finishing on 50% (and in 7th place) Hao beat the World No. 1 and the World Champion in successive rounds. The thing to note with this tournament was the number of decisive games, with 24 wins ahead of 21 draws. In part this was due to both Karjakin at the top (+5=2-2) and Hammer at the bottom (+1=1-7), but every player dropped at least 1 game. A rarity at this level. Having just started another round of junior coaching, I'm always on the lookout for a set of 'stock' games I can show my students. The level of students requires a little bit of a balancing act, as they hover between being able to solve specific problems (mate in 2, material winning combinations), while not always finding them in actual games. While I lean towards the Morphy/Blackburne style of game (rapid development, central control, tactical finish), such games often contain things you want to teach (mating attacks), and some things you want to avoid for now (giving up material). Today I played the kind of game that falls into this category. I was quite pleased by the finish, which demonstrates some nice tactics, but it did depend on a little bit of generosity from my opponent. In initially declining to take on f7 in the Traxler, he gave me a couple of free moves. Eventually he decided that he should take on f7, but this only played into my hands. It turns out I also missed 12. ... Nxh2! but if I had played it, I may not have ended the game in the way I was looking for. While working on my tactical training, I've come across two sorts scoring systems. The first is to rate your results on the accuracy of your solutions, while the second is to take the speed of your solutions into account. While I can see the merit in the second system, I've always felt that to 'reward' fast solutions also encourages mistakes. The temptation to try the first plausible move can be dangerous, and may prevent you from correctly analysing real game positions. As a follow up to this, I wondered whether there is a direct correlation between chess strength and solving speed. I suspect there is, but what form this correlation takes was, up until now, a little unclear. But someone was thinking about this topic before me, and has produced a short discussion post on the topic. Have a look at this post at the AoxomoxoA Wondering blog, where the author uses his own experiences to try and answer the question. I wouldn't say it is a comprehensive answer to the initial question, but it is at least a start. I've been having a look at the Boden-Kieseritzky Gambit, and I am wondering if it is all over for this variation. The Gambit starts with 1.e4 e5 2.Nf3 Nc6 3.Bc4 Nf6 4.Nc3 Nxe4 5.O-O It can also arise after 4.O-O Nxe4 5.Nc3, while 5.Nxe4 is met by the 'fork trick' of 5. ... d5. After 5. ... Nxc3 6.dxc3 Black has to worry about Ng5 ideas, and normally defends with 6. ... f6. This is the line given in most books I've read, but an overlooked possibility is 6. 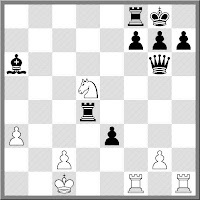 ... h6 It obviously prevents Ng5, but does allow White some other tricks. One of them is the immediate capture on e5 with 7. 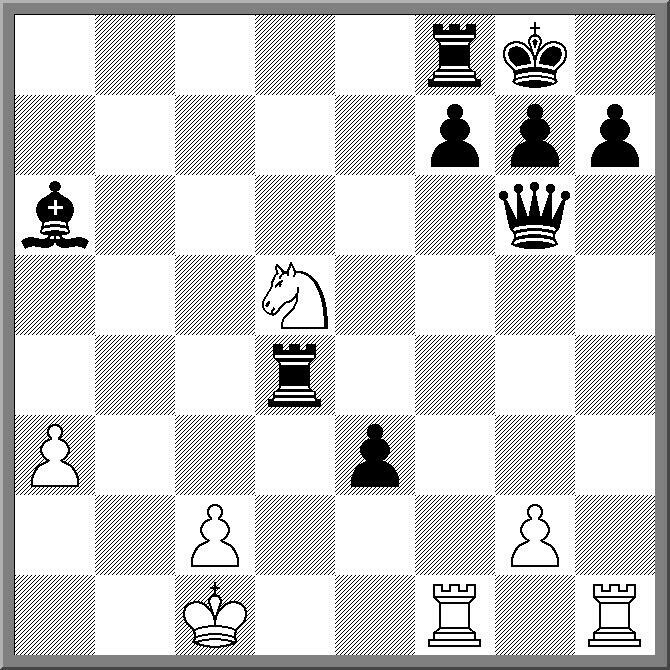 Nxe5 Nxe5 8.Re1 It looks as though Black must return the piece, but after 8. ... Qe7! 9.f4 Nxc4 Black surrenders his Queen in return for a rook and two bits. In the only game I have found using this line, this was more than enough for Black, who went on to win quite quickly. From the early rounds of the 2013 European Championship comes the following wild encounter. By move 22 Black has 3 pawns on the 6th rank and Whites position looks decidedly scary. However like the Charge of the Light Brigade, it was more for show than anything else, and White soon eliminates them. However the fun then continues with White chasing the Black king around the board, before the game eventually ends in a draw. Lost in the hubbub of Norway/Alekhine/GP series of events, is the 2013 European Championship, which is currently being held in Legnica, Poland. In fact the end of the tournament is quite near, with Alexander Moiseenko leading with 7/8, over Constantin Lupulescu. The leaders are a bit of a surprise as both are rated below 2700, while a number of the 2700+ brigade (11 in all) are someway back, sitting on +1 or +2. As with previous editions of this event, the field is top heavy with GM's. In fact over half the field holds a Grandmaster title, making the battle for the top placings particularly tough. Of course some players hope to win the overall event, but also on offer are a number of qualifying spots for the 2013 World Cup, and the last few rounds will see players calculating their chances of a second payday. The website for the tournament is here, and contains all the results, games and media coverage of the tournament. Dr Who to play and checkmate in 6 moves. From the fertile mind that brought you QWOP, Bennett Foddy, comes a new take on chess. He has created a game called Bennett Foddy's Speed Chess (I assume he has attached his own name to the front, not out of ego, but simply to differentiate it from all the other versions of Speed Chess that already exist). The basic idea is that 16 players each start with a pawn which they can move at any time, and the first player to capture the king wins. Pawns do promote, so players can 'level up' during the game, which seems to last around 4.5 seconds on average. But rather than have me try and describe an idea whose time may or may not have come, simply have a look at this article, which includes a video of the game. Igor Bjelobrk has won the 2013 Oceania Zonal, and in the process has also picked up a somewhat overdue IM title. He defeated GM Darryl Johansen in the final round to finish the tournament undefeated on 7.5/9. This left him half a point ahead of Ari Dale, who also earned an IM title (under the 66% rule). In outright third was Justin Tan, meaning Australian players filled the top 3 places. Of the non-Australian players, FM Bob Smith (NZ) and FM Stuart Fancy (PNG) did the best, tied for 7th on 5.5/0. Fancy started the tournament slowly (2.5/6) but finished with 3 wins, including a last round victory over IM Vladimir Feldman. In the Womens Zonal, IM Irina Berezina and WIM Emma Guo tied for first place with 8/9. In the playogg match that followed the final round Berezina defeated Guo 2-0, to claim the Oceania place in the next Womens World Championship Knock Out. Final results for the Open Zonal are here, while the Womens Zonal results are here. The first round of the 2013 Norway Chess tournament got of to a combative start with only 2 of the 5 games ending in draws. One of those draws was by pre-tournament favourite Magnus Carlsen, against the resurgent Veselin Topalov. The other Norwegian player Jon Ludwig Hammer made the brave choice of playing the Grunfeld against the worlds foremost Grunfeld advocate Peter Svidler, but it wasn't until the ending that Svidler came out on top. Aronian and Anand drew, while Karjakin beat Radjabov. The other game was between Hikaru Nakarmura and Wang Hao, which led one wag on Chessvibes to state "Naka ... beats the Wang"
FM Junta Ikeda has won the 2013 Japanese Chess Championship. Having moved to Japan a month ago for University study, Ikeda took the opportunity to play in the 11 round event. He scored 9.5/11 (+8=3-0) and finished a point ahead of top seed FM Shin'ya Kojima. As it turns out Junta was not the only Canberra playing taking part, as Chris Kevork also played in the event. After 8 rounds he was on 50% but unfortunately I don't have the final crosstable to hand. Last week it was the Alekhine Memorial, this week it is Norway Chess 2013. This 10 player tournament is headed by hometown hero Magnus Carlsen, with Lev Aronian, Veselin Topalov, Viswanathan Anand, Hikaru Nakamura, Peter Svidler, Sergey Karjakin, Teimour Radjabov, Wang Hao and Jon Ludvig Hammer making up the rest of the field. The tournament has 9 of the top 16 players in the world taking part, with Hammer being the only player from further down the rating list. The tournament opens tonight, with a lightning event starting at 1700 (Norway time), which is 1am Canberra time. Tomorrow sees the first round, which will start a couple of hours earlier (11pm Canberra time). Obviously Carlsen is favourite to win the event, but both Anand and Topalov seem to be on the improve. However they, and second seed Aronian have all just finished tough events (as have a few others), so whether they have the energy to take first place is still the question. An odd story from India concerning what might be the worst organised chess event in history. The Under 2200 FIDE rated event was expected to attract a field of 200 players, but instead only managed 30 players. Some of the visiting players were paid appearance money, but part of the conditions were that they lose to the local players to 'help the local talent'. The whole thing sounds like a complete train wreck, but in case I have misreported the facts, you can read what the "The Hindu" said about it here. Well it looks like this decision is causing a new set of problems, with both the Carlsen camp and rival bidders questioning the process. The Norwegian Chess Federation has asked FIDE to open a bidding process, while Paris is apparently willing to put up a bid, with a larger budget than the Chennai bid. So FIDE finds itself in a bind of its own making, as it may miss out on a bigger World Championship event if it sticks with Chennai, while reneging on the arrangement with Chennai may poison relationships with both India, and future bidding Federations. One suggestion I have seen, and possibly the only way to walk this fine line, is to open a bidding process, but then allow Chennai the right to match the final bid (the 'right of first refusal'). However I'm not sure Chennai would be happy to accept this, as I'm sure they already think the match is theirs. Here is a link to the FIDE regulations for the 2013 World Championship Match. While it does mention a bidding process, it does not specify how the process is to take place, and gives FIDE the right to reject any bid! The 2013 Oceania Zonal begins tomorrow in Fiji. The Open Zonal has attracted 37 players while the Womens Zonal has a smaller field of 14 players. The top 3 seeds in the Open Zonal are GM Darryl Johansen, IM Max Illingworth and IM Gary Lane, while IM Irina Berezina and WIM Emma Guo are the favourites for the Womens Zonal. During the Zonal there will also be a couple of important meetings with the Oceania Chess Confederation holding an executive meeting, and the FIDE Development Commission holding their first ever meeting in the South Pacific. I'm off to the Fair this Sunday, specifically the Michelago Mayfair. As part of the activities I will be giving a simul, taking on all comers. The event starts at 10am and I will probably playing until around 3pm. This is the first time I've done this (Lee Forace normally plays the simul) but I suspect it won't be one big simul, rather a succession of smaller ones. So if you wish to make the trip to Michelago (about 50km south of Canberra, but only 20 minutes from Tuggeranong) this Sunday, you can be guaranteed an enjoyable day out, as well as a little chess on the side. Lev Aronian and Boris Gelfand have tied for first in the 2013 Alekhine Memorial. A score of 5.5 (+2) was enough for first place, with Aronian winning the title on count-back (Most wins). In outright third was Vishwanathan Anand on 5. While the field was a mix of top 10 players and 2700's, it is interesting that both Gelfand and Anand finished where they did. During last years World Championship match between the two, there were plenty of comments about the quality of play, and more importantly, the quality of the players. While I certainly agree that a number of games in the match were disappointing, both players have clearly shown that they still belong in the chess elite. This also bodes well for the Anand - Carlsen match, as it also shows that Anand will be no pushover. FIDE have recently switched to monthly rating reports, which has had the side effect of creating a busier work schedule for Federations. This has already created problems in Australia, with a large number of tournaments which were to be rated on the May 2013 apparently being shifted to June 2013. Significantly, important Australian events like the Doeberl Cup and the Sydney International Open have been affected by this change. In the case of both tournaments, the rating files for the events were submitted to the Australian Chess Federations FIDE Ratings Officer almost immediately after the completion of the events, but it appears they weren't forwarded to FIDE. There is also the parallel problem of some events not being registered at all (eg 2013 ANU Masters), despite the information being forwarded to the ACF's FRO in a timely manner. Having exchanged emails with the Secretary of the FIDE Qualification Committee when the problems with rating Australian events first became apparent, it is not clear whether these events can now be rated at all. I am aware that the ACF is trying to fix the problem, but I am not sure how successful they will be. Having registered and submitted events on behalf of a couple of Oceania Federations (Solomon Islands, Guam) it isn't that hard a job, as FIDE approved pairing programs normally generate a report that can be uploaded to the FIDE Ratings Service with the push of a button. Occasionally new players need to be registered, but even this is a fairly straightforward task. But for now players will have to wait an extra month to have their ratings updated. Of course this is what used to happen prior to this year (when list were every 2 or 3 months), but for tournament organisers this is not that satisfactory, especially as the ACF charge a service fee for processing these events (even ones where the FIDE rating charge is $0.00). I'm assuming some of the problems should be fixed by the next list, but I can only wonder if all of them will be.